This is my pony persona, Trivia. 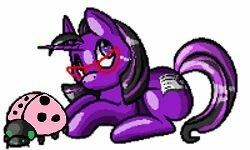 She's an earth pony that loves to read and study as much as she can. I think she could give Twilight Sparkle a run for her study. She's a bit too honest and sometimes it hurts people's feelings. She doesn't mean to though. And when she is someone's friend, she is very protective and loyal. She is also much stronger than one would expect a book worm to be. She loves coffee and can be a bit hyper because she drinks a lot of coffee. Especially if she's in the middle of a good book. She is the pony everyone goes to for random facts. Thanks! It worked! Thanks @Slinky! Thanks! I had a blast drawing her. I really picked her colors because the Pink baby Ember was the pony that I used to represent me when I was little. She was different than all the other baby ponies because she didn't have a symbol and I was different from all the other kids back then because of my health issues. So baby Ember was really my very first Pony Persona. So when I decided to make one as a grown up, naturally I used those same colors but made her a grown up and all that. 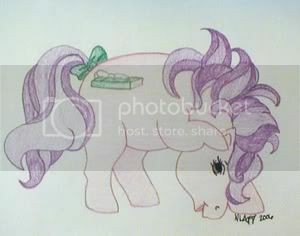 It's strange but My Little Pony has been woven into my life since I was 3 or 4 years old. Anyway, She does love Coffee. Probably more than is healthy for any pony to drink. But that's ok.